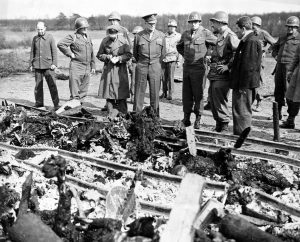 In the photo, Generals Eisenhower, Bradley, and Patton inspect corpses at Ohrdruf Concentration Camp, a sub-camp of Buchenwald, after its liberation in 1945. Eisenhower wisely predicted that soon, people would deny that the Holocaust occurred, so he ordered voluminous documentation. This included a U.S. Army film by famous director George Stevens (“Giant”). If you want to see real Nazis and a real concentration camp, watch it. Then tell me what you think of the leftists who compare Trump to Hitler and our immigration facilities to Auschwitz. Hitler committed suicide at 60, after being responsible for 40 to 50 million deaths. About 2 million civilians, mainly Jews, were gassed and cremated at Auschwitz. Trump is 72 and has killed no one. If Trump is Hitler, Hitler killed no one. No one has been gassed and cremated at the immigration facilities. If the immigration facilities are like Auschwitz, there were no gas chambers or ovens. When leftists call Trump Hitler and compare immigration facilities to Auschwitz, they are not merely trivializing the Holocaust ‒ they are denying it. How inexpressibly sad it is to see people who consider themselves liberals and Democrats commit such despicable acts. I’m a Jew. My maternal grandfather was a rabbi, as was my wife’s maternal grandfather. I spent most of my career in medical oncology, working on a salary in a large public hospital, and caring for many minority patients. To top things off, my father’s eldest brother was murdered in the Holocaust. So who could possibly mistake me for a Nazi? An older colleague condemned Starr for subpoenaing the records of Monica Lewinsky’s book purchases. My colleague believed that this opened the door to government control of books. I explained that Monica claimed that she had bought specific books as gifts for Bill, and Starr was trying to verify her story. If she lied about this, she might be lying about other things as well. But she wasn’t lying. I added that this didn’t mean Starr was trying to control our reading material. After all, he also subpoenaed the infamous blue dress, and this didn’t mean he wanted to control women’s fashions. I never spoke to him again. I could never forgive him for trivializing Nazism and the Holocaust. If a moderate conservative was a Nazi, how bad could Nazis be? My wife and I had been friendly with another couple for years. We had eaten dinner together. They were progressive, but we spent most of our time discussing nonpolitical subjects. Then I had a health scare. Things came out alright, but at the time my wife was quite worried. My wife’s birthday was near, and her friend took her out for lunch, both to celebrate the birthday and to give her a respite from her concerns. The conversation went well, dealing with personal matters. Suddenly, the woman blurted out that she could continue to meet my wife for lunch, but she and her husband could no longer have dinner with us, because I was a “Nazi.” My wife sat dumbfounded. She is rarely at a loss for words, but this attack came so unexpectedly that she didn’t know what to reply . Later my wife assumed her former friend was referring to my website. But at the time, all she could do was to get up, walk out, and never speak to the woman again. The woman was shorter than my wife, which quite possibly saved her from having a lunch dumped on her head. The woman made no attempt to repair the situation. The self-righteous see no reason for them to extend a hand. Obviously, Hitler did not have a Jewish son-in-law, a daughter who converted to Judaism, three Jewish grandchildren, and another daughter who is going with a Jew. Nor did Hitler move his embassy to Jerusalem, or open Palm Beach hotels to blacks and Jews. To call Trump “Hitler” is to deny Hitler’s genocidal Judenhass, his eliminationist Jew hatred that he expressed as early as 1919. This is to deny the very motivation for the Holocaust. So far, the abusive language and assaults have been almost exclusively from the Left. But this cannot go on indefinitely. Sooner or later, conservatives will begin responding. They take a dim view of harassing women, and a dimmer view of threatening children. And they own many more firearms ‒ and know how to use them. Let us call a halt before a government official is injured or killed, and people feel compelled to retaliate. Let us stop the descent into violence before it gets out of control. Given time, I could forgive the personal insults. But the targeting of the children and grandchildren of public officials? The trivialization of Nazism and the Holocaust, which now is merging into Holocaust denial? Those I will not forgive. You may not be a fool but you make foolish statements. Nobody claims Trump is carrying out genocide NOW. They are afraid this is Nazism in the embryo stage when we can still stop it. Targeting Muslims is just the first stage. Trump is 72. That’s a really old embryo. When is he going to get around to the world war and the genocide? When he’s 75? Is anyone we disagree with “Hitler”? Then Hitler must have been merely an annoying fellow who talked too loudly. But the ban does include Venezuela, which is hardly Muslim. It is therefore not a “Muslim ban” by any stretch of the imagination. It merely requires entrants from nations with extensive terrorist networks to be closely screened. It is illogical to claim that the “travel ban” is unconstitutional because it affects mainly Muslims. During World War 2, we banned entrants from Germany, who were close to 99% Christian. Should the Supreme Court have required President Roosevelt to admit Germans, because Christians were disproportionately affected? A little historical perspective helps. Too bad no one learns history anymore.